Santa's Late! The stock market as measured by the DJIA closed the week down at 11,866, showing significant deviation from the santa rally script with barely a week remaining, the lack of progress to the upside has been as a consequences of the increasing mass of unserviceable debt out of the euro-zone where politicians repeatedly show themselves to be ignorant of the facts and what to do to get out of the hole that the euro-zone is sinking deeper into an economic depression each day. The euro-zone politicians appear single mindedly determined to do absolutely NOTHING to save the euro-zone, which is the reason why the bulk of my analysis and articles of the past 6 months has been centred around the risks coming out of the euro-zone, because just when you thought that they had succeeded at kicking the can a few months down the road, which was the conclusion of last weeks analysis that the risks of a collapse of the banking system had been delayed until at least Mid Jan 2012, instead this week has seen last weeks rescue plan already starting to disintegrate. 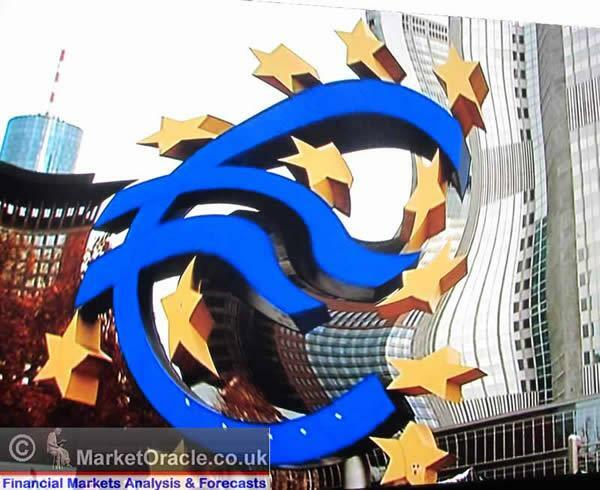 The discredited credit rating agencies have been busy issuing a string of warnings that they are ready to start downgrading virtually the whole euro-zone starting with the 5 PIIGS and then to target the euro-core with Fitch putting France on negative death watch as well as downgrading 7 of the worlds biggest banks. Even Belgium that had somehow been managing to fly under the radar despite its own bankrupt banks and debt burden was down graded by Moody's to Aa3. The Bond Markets have had French 10 year bonds trading as high as 4% in recent weeks that's near double the interest rate charged to the UK to finance its debts, albeit more recent rates are 3.20% against 2.10% for the UK, which is still a sizeable disparity for countries that to academic economists appear very similar in many respects. Off course the markets do not follow academic models that because the markets discount the future, and don't care for what's visible in the rear view mirror. How did French politician's react to the threats of debt downgrades ? The French President Sarkozy eager to come across to the French electorate as the savior of the euro-zone and thereby get himself re-elected in April 2012 (behind in the polls) was still smarting from last weeks British rebuttal of the German / French Eurozone rescue attempt, let lose his attack dogs on Britain so as to both politically and economically diminish the growing status of Britain in Europe as it increasingly looks like that France itself made a huge mistake in joining the euro-zone as illustrated by comments form the head of the French central bank, Christian Noyer attacking the British economy. Christian Noyer stated "A downgrade doesn't strike me as justified based on economic fundamentals. Or if it is they should start by downgrading the UK, which has a bigger deficit, as much debt, more inflation, weaker growth and where bank lending is collapsing." The French Finance Minister, François Baroin, also jumped in with “Great Britain is in a very difficult economic situation, a deficit close to the level of Greece, debt equivalent to our own, much higher inflation prospects and growth forecasts well under the eurozone average. It’s an audacious choice the British government has made,” and referring to last weeks summit UK veto "with the singular, now solitary, exception of Great Britain, which history will remember as marginalised”. And continuing his downgrade panic driven attack rhetoric further "It's true that the economic situation in Great Britain is very worrying and that we prefer being French rather than British on the economic front at the moment" and again speaking to a newspaper “the rating agencies should start by degrading the United Kingdom, which has greater deficits, as much debt, more inflation and less growth than us." Whilst on face value Britain's economic and debt situation is worse than that of France which the recent article (28 Nov 2011 - Eurozone Being Swallowed by Expanding Debt Black Holes, Mega Bond Market Profits and Default Booms ) illustrated at length that UK total debt (public+private) approximates 500% of GDP against French total debt of 350%. However, what the French central bankers fail to acknowledge is that there are two major reasons why France is being accurately perceived as a far higher credit risk by both the markets and the one year behind the curve credit ratings agencies. 1. The UK can print money which the French gave up the right to do in exchange for a stable currency. This is a major advantage for the UK which virtually ensures that the UK would be the last country standing in Europe to default on its debts, AFTER all of the others including France, and even mighty Germany have gone bust because Britain can easily with just a whisper from George Osbourne's lips into the ear of Mervyn King conjure as much money as is needed into existence to monetize UK government debt, and have done so to the tune of £275 billion to date, which has been funneled to the banks to buy government bonds to reduce UK interest bond market interest rates whilst at the same time resulting in higher UK inflation, which is the price for printing money. 2. That French debt is denominated in euros and their currency is the Euro that is primed to collapse as a consequence of fellow bankrupting euro-zone members who's deficits are unsustainable and in fact have already triggered a default in all but name, i.e. Greece HAS defaulted on its debts, with Greek bond holders sitting on losses of upwards of 50%. Therefore France being in the Euro-zone shares the risks of default for many of the reasons why Greece defaulted also equally applies to France in that France is finding itself unable to grow or inflate its way out of the debt burden, which ensures that ultimately France is just a big version of Greece and as we have seen during the year with the PIIGS, the markets do not calmly wait for debt to GDP to reach 100%+, instead the markets usually panic when it becomes crystal clear that the debt trajectory is definitely unsustainable as a consequence of the fundamentals therefore France can scream and shout for as long as it wants to that the UK has a worse debt position when the market reaction makes French official debt to GDP of 85% (real total 350%) as just as bad as if they had 120% of debt to GDP, for the markets already know that ALL of the governments are lying with France at least 350% of GDP in terms of total debt (UK 500%). Whereas the UK has its own currency that it can print (debase) at will and therefore whilst volatility may be high there is no imminent risk of collapse of sterling on anywhere near the risk posed by euro-zone countries. The market knows that the Bank of England is always ready to monetize UK debt to alleviate short-term pressures that would result in collapse of the banking system. In fact the primary risks to the UK banking system at this point in time are contagion risks out of the Eurozone that's PIIGS, French and German banks triggering a chain reaction collapse of the global banking system a taste of which we recently witnessed with the collapse of the MF Global as a consequence of over leveraged exposure to Italian government bonds which resulted in the loss of actual deposits of customers who had little understanding that their funds / were being used as collateral to gamble on Italian government debt. You think you money is not at risk in the banks ? Think again, learn the lesson from MF Global where 400,000 people with accounts with have seen their monies vanish into thin air because the small print allowed MF Global to gamble with their client monies despite being in segregated accounts.. So the head of the French Central bank is deliberately trying to push markets attention away from the fact that the crisis has reached a critical point and trying to ignore that both France and Germany are directly responsible for the euro-zone debt crisis because BOTH countries themselves broke the fiscal rules as contained within the Maastrict Treaty right near the very start of the Euro currency and thus gave the green light for others to also go on a borrowing and spending binge on low interest rates. The risks of a collapse of the banking system most definitely are with a trigger out of the Eurozone and particularly France than the UK, therefore the credit ratings agencies whilst being several years behind the curve are correct to see the credit risk of French debt as being far, far higher than that of the UK for it does pose a severe risk as evidenced by rising French government debt market interest rates. But what the credit rating agencies appear blind to is the fact that no government would be able to escape the consequences of a collapse of the euro-zone or default of the debts of any major economy, even Greece leaving the euro-zone could be enough to trigger banking system collapse as they would all fall like dominoes one after the other eventually including even the worlds reserve currency holder, the United States, in which case maybe a downgrade of France could be the trigger that starts a cascading collapse of the eurozone which explains the panic in Paris. If France becomes Italy overnight then where does the money come for all these ever expanding bailout funds? Throw France also in the mix and the bailout pot required would extend to at least Euro 5 trillion which Germany as the last euro man standing is just not big enough to bailout everyone! So France instead of putting several hundred billions of euros into the bailout pot, may find itself after a credit ratings downgrade seeking several hundred billions in bailout funds itself in a matter of months, especially as it has about as much debt requiring refinancing during 2012 as Italy (about Euro 400 billion). Meanwhile the Eurozone rescue summit of barely a week ago looks as though it is already in serious trouble with many countries now having second thoughts such as Sweden, Czech Republic and Hungary as they realise that they don't want to be put under German Bundesbank control, so instead of Britain being against the 26, the reality is that it is more like currently 20 against 6 and by March 2012 at best 17 against 10, though more likely it will be less than 10 against the rest, with chances that ultimately even France itself will not be able to politically stomach being dictated to on its tax and spending from Berlin (especially in advance of an election) despite the consequences, all of which will become apparent in the debt and equity markets long before you see the news in the mainstream broadcast media, therefore europe looks set for a perfect storm of paralysis and a series of escalating panics during the first 6 months of 2012, which will act as a trigger to kick start money printing by the ECB on a huge scale i.e. at least Euro 1.5 trillion of QE, which I had expected would have started by now, though the longer the delay the more the pain and greater will be the ultimate cost. So my last Friday's hopes that the muddle through summit would buy some time for the bankrupt eurozone banking system into mid January 2012 is now starting to look not so safe a bet, which means its back to building and maintaining those firewall's against the bankrupt banks that are literally teetering on the brink of collapse as evidenced by continue freezing of the interbank LIBOR market as investors dump euros for dollars, german bund's and even UK government debt leaving banks unable to borrow from one another instead being forced to borrow at far higher short-term rates form corporations, that's right! Euro-zone banks are borrowing at high short-term interest rates from cash rich corporate's which is surely unsustainable as bank after bank experiences being locked out of the money markets and forced to go cap in hand to the ECB with French banks topping the list to borrow and pay down their debt rather than the refinancing of maturing sovereign debt. 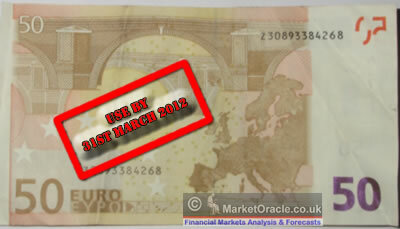 Euro Collapse, What Would happen? Should the now not so unthinkable happen then none of the eurozone member countries would escape the impact of a collapse of the currency in the rush to reintroduce replacement currencies, all of which would lose value against the existing Euro which will probably continue to exist in some semi-frozen state, i.e. I doubt many more new notes would be printed in an attempt at preserving its value against which all other currencies would be converted, so Euro notes and coins would become the most valuable money as those with cash in Euro-zone banks would have their accounts frozen during the process of reintroduction of domestic currencies which means heavy loss of value, especially for the Greeks, any money in Greek banks will become pretty much worthless. Even the mighty German DMark would take a good 25% hit with the rest on a falling scale towards Greece's Drachma perhaps trading at a 90% discount to the euro. So my best advice to my euro-zone readers, is to pull cash out of the banks and keep your money in cash, euro notes, or better still german euro notes, though given the limited number in circulation when compared against bank deposits and sovereign bonds, I am assuming that all euro bank notes across member states would be equally valued, anything less risks, well hyperinflation! i.e. as a consequence of loss of faith in currency. So no, I don't think the ECB would be so stupid as to not equally guarantee ALL euro notes and coins in circulation as having the SAME value regardless of local symbols printed on the notes. Still when people panic things can become pretty irrational, in which case if you see someone pushing a wheel barrow full of Greek Euro notes then that might prove to be a bargain buy, though check to make sure they have not been stamped as effectively having become temporary Drachma's! Whilst most are focused on the announcements out of France and Germany, what many may not be aware of is the ongoing run on PIIGS banks as depositors withdraw cash (Euro's) with governments and banks scrambling to reduce the flight of capital from the banking systems such as Italy announcing plans to limit cash transactions of over Euro 1000, and if you have been reading my past commentaries you will know one of the prerequisites for hyperinflation is a sharp increase in the amount of notes in circulation because it increases the velocity of money as cash cannot be destroyed through default instead is continuously and increasingly exchanged for goods and services resulting in rising inflation, and the higher inflation goes the less likely people are to hold onto cash for any length of time and the higher inflation goes in an upward spiral, so depositors pulling funds out of banks into cash is very bad news for the inflation expectations for these countries, especially as academic economists in the mainstream press have been banging the deflation drum quite loudly for the past 6months so the shock of rising inflation instead of deflation will act as a further impetus towards increasing the velocity of money. All that matters is this - No matter what happens to the Euro, its collapse threatens a collapse of the worlds banking system therefore it will not be allowed to collapse, which means the worlds reserve currency will be printed in the trillions to mop up the flood of euro's in exchange for dollars thus ensuring there is no collapse in the euro for which we have just had a small taste of what would come to pass, its simple - print dollars and all other currencies for euros which means all currencies collapse together but at a shallower pace with the mainstream press pumping out propaganda that the Euro has actually risen when in fact they have all fallen sharply together, now you tell me if all this will not be highly inflationary? The worlds central banks can and do print trillions as and when they chose to. There is no limit. This is the only real lesson they learned from the Great Depression, so instead of having a Deflationary Depression, we are having an Inflationary Depression. The ECB WILL start to MONETIZE PIIGS DEBT, the ECB WILL BAILOUT the European banks, probably this month. Though what the ECB does not know is how bankrupt the European banks really are, because neither do they! The derivatives market is estimated at $1 Quadrillion, nowhere have I read in any official statistics anything that comes close to addressing this. What happens to the value of currencies if this needs to be monetized ? I know Zimbabwe was printing 100 trillion dollar notes at its money printing peak, this is what lies in store because ALL fiat currencies are trending towards HYPERINFLATION (don't worry I'll let you know when). Remember countries can only go bankrupt if they cannot print money, if they can print then you cannot go bankrupt because they stealth default on their debts by means of high inflation, I will cover this in my next article in-depth. At the end of the day money printing is highly inflationary, if you are still skeptical of the unfolding inflation mega-trend, well then prepare to lose at least 80% of the real value of your money deposited in the banks over the next 10 years, and much sooner if the euro-zone actually does explode, either way you lose! Protect Your Bank Deposits from the Bankrupt Banks and Inflation NOW! Yes, if you have not already done so then you really do need to protect your deposits against the bankrupt banks, because as I warned of right BEFORE Lehman's went bust in 2008 and continuing into 2011, the bankrupt banks are sitting on monumental contagion risks courtesy of their off balance sheet derivatives positions that have grown from $500 trillion in 2008 to over $1.5 quadrillion today! These bankrupt banks have tripled the risk over the past 3 years! This is clear evidence of a ponzi scheme that continuously requires expansion to prevent implosion that is becoming inherently more unstable over the passage of time. Off course you should be eyeing moving your funds out of all banks because after tax your destined to lose a good 3% per year of your deposited funds value anyway. In this respect you do have to take on a little risk, but given that the funds on deposit at the banks are at risk anyway you can protect against the inflation mega-trend for instance by buying corporate bonds, for example Tesco's very recent offering of 2019 RPI Index linked Corporate Bonds that Pays RPI +1% (also indexed), which if held to maturity protects you against inflation with very little risk, also if purchased in an ISA the interest is tax free, and being a corporate bond is traded on the secondary market (can be bought and sold at any time via your stock broker). Those that say hyperinflation cannot happen do not understand the consequences of the ticking derivatives ponzi time bomb, if it were to explode and it could as consequence of bank contagion risk from something such as one of the PIIGS defaulting, the resulting panic would ignite Central Bank QE on an epic inflationary scale as that is the only answer they would have to settle the derivatives contracts to prevent total financial and economic collapse. The bottom line is this you need to first create a firewall between yourselves and all aspects of the bankrupt banking system, and then against fiat currency because no matter what the official inflation statistics state, you already KNOW that the money in your pocket is losing value fast, at perhaps as much as 15% per annum in terms of what you actually need to buy to feed, clothe and warm yourselves. War in the Middle East ? When politicians are under intense pressure from revolting populations as a consequence of economic depression then they always look to switch the blame onto someone else, preferably foreigners to unite against, the French have spent the week blaming their traditional best enemy Britain with a war of words, however, there is a risk of a real war coming out of this crisis if the global financial system continues the trend towards collapse and the prime candidates for war are Syria and Iran. 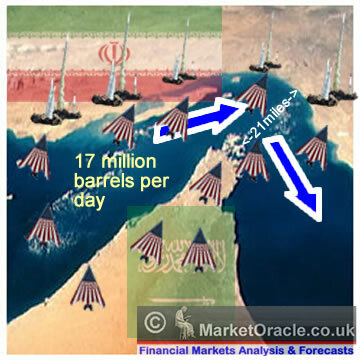 After 10 years of bloodletting, the last American troops have now left Iraq for their military bases in Kuwait, will 2012 see the first American troops invade Iran? As ever America's poodle, Britain will be there as well as the French and many more bankrupting european states all lining up one after another eager to distract their suffering populations and allow them to enact their own Patriot and Traitor Acts to silence dissent. My last quick look at the stock market concluded in the following trend expectation that targeted a new bull market high just prior to year end (01 Dec 2011 - Stock Market Panic Buying). According to the script the Dow should be at around 12,300 by now, instead it last traded at 11,866, which therefore implies a 1000 point rally is necessary for the market to achieve its santa rally target, whilst not impossible, but given continuing immediate trend weakness is a tough ask for less than 2 weeks. Trend Analysis - The Dow reacted from resistance at 12,290 by retreating to 11,800, a trend which so far is corrective in nature. However as of writing there is no sign that the correction being over, but as things stand the corrective pattern is resembling a falling wedge as bullish for the stock market, that looks set to resolve to the upside with at least a similar trend trajectory to the decline which implies a 500 point advance by year end. Support and Resistance - Resistance is as 12260-12290 and support very nearby at just below 11,800, further support is at 11,620 should the correction continue. A breakout of 12290 would target a swing to between 12750 and 12876 which implies it could take another correction before the Dow can break the bull market high. Elliott Wave Theory - Taking the early October low as the end for the correction therefore a Wave C of an ABC, then this implies 5 waves higher of which we have completed Impulse eave 1 and corrective wave 2 and thus are now in Wave 3 of which we appear to have completed minor impulse wave 1 and are in corrective wave 2 about to start minor impulse wave 3. This count is very bullish for stocks, too bullish, for now I will go with this being a Wave 3 which suggests we are 40% way through the move so extends into Mid January 2012. Which also allows the pattern to morph into something more complex i.e. a triple ABC which as of writing appears more probable. The primary assumption I am making here is that the euro-zone does not start to completely collapse (10% chance) i.e. an event such as France turning into an Italy with 10 year bond interest rates soaring to over 6% (current 3%) during the next few weeks. If it does happen then all bets are off! We are flying over the edge of the eurozone black hole event horizon that would near instantly destroy more global economic activity than that which took place during the great recession of 2008-2009 and hit asset markets hard. Therefore my quick take is for immediate price action to continue last weeks weakness into the start of the week that risks an intra-day break of 11,800 support. Early week weakness will not leave many trading days remaining before year end, which thus implies a lower forecast range that targets a Dow year end close of between 12,400 and 12,600 or about 600 points from where ever the Dow will make a low early next week, and implies a continuing rally during the new year towards a new bull market high as still being possible during mid January 2012 as illustrated by the below graph. 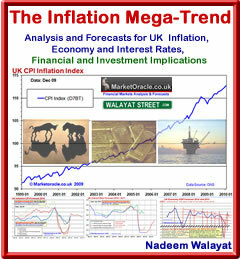 I have a load of analysis to complete on the economy, inflation mega-trend, and UK housing market before I will be able to move towards a detailed technical picture for stocks for 2012. However, taking the ongoing euro-zone debt crisis into account, the implications are strongly negative for the stock market trend for 2012, which at this point suggests a great deal of volatility during the first half of 2012 i.e. large risks to the downside in response to the worsening state of the euro-zone that looks set to emit waves of panic during the first half of the year as the euro-zone politicians will only finally act under intense market pressure (higher bond market interest rates). So far my strategy for the duration of the bull market has been pretty simple (as illustrated by my archive and newsletters) which has been to buy corrections, namely the greater the correction the greater the buying opportunity, which is why the deep discounts during the Summer / Autumn 2011 correction has seen my stocks portfolio mushroom to its largest size in nominal terms of my 25 year trading history amounting to a net long position at 30% of total assets. However, the events of the past couple of weeks has put me on the defensive going into the end of the year, and has me viewing the anticipated santa rally as an opportunity to reduce my net long position down to a more comfortable 20% risk over the next few weeks through sales and hedges. As things stand today, the first half of 2012 is not looking good for stocks and other asset markets, we will probably see several market panics in response to the ongoing euro-zone debt and economic crisis, and the second half needs work to determine to any reliable extent, but I am assuming that we will see the euro emerge intact from this crisis as a consequence of global coordinated central bank QE's and other special measures that will succeed in igniting asset price recoveries during the second half of 2012, hopefully this foggy picture will become much clearer over the next few weeks as each piece of analysis is completed. Your analyst, waiting for central bankers to do their job.